I went to jail on Friday. Let me tell you all about it. Being an avid cardmaker, I was asked a few weeks ago if I would be interested in participating in a little community outreach project. Sure! That sounded good. As I listened, I realized that maybe I should not have agreed quite so quickly. You see, this outreach project was to teach Christmas card making to inmates of our county jail. This past Monday, all the plans were set in stone. 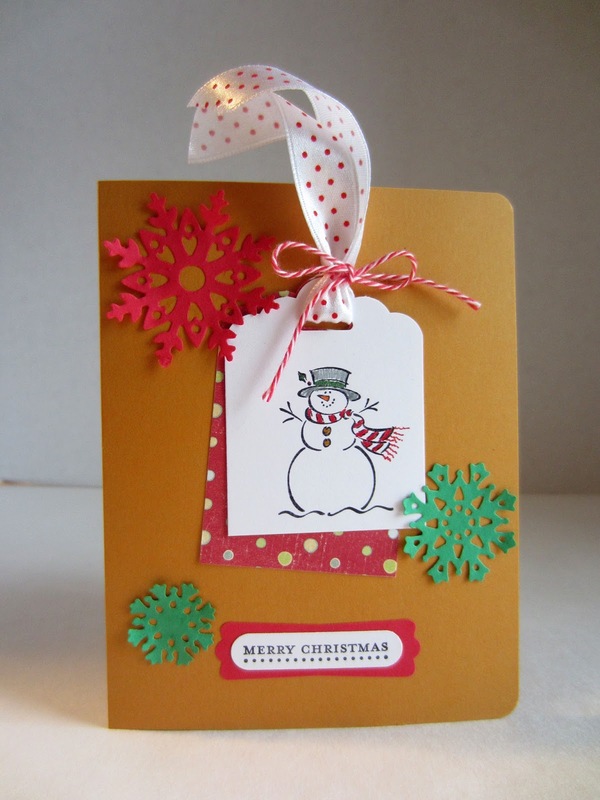 I was to create two Christmas cards and provide all the supplies and preparation for EIGHTEEN JAIL INMATES to make. GULP. Two days later, the updated number had gone up to 20. And they were all males. As I prepared to create the two cards, I had several questions, including CAN THEY HAVE SCISSORS? Probably not, so I came up with one project for which I spent a few hours cutting out all the components for one of the cards. Lots of different sentiments and decorative details they could choose from. Not wanting the cards to be just too basic, I added a little flair with drawn-on polka dots and ribbon. This way, they'd be able to make it uniquely their own, what with various choices and all. We had two hours with these guys. And, even though we did not have to fill up the entire two hours, I wanted to make it worthwhile for them. So, on the other card, I decided that, if they chose, they could do a little coloring with markers. I precut some tags, both a white one with the snowman to color, and a printed cardstock layer for underneath in a variety of designs. So they would have another choice to make. My Big Shot and punches had a good workout! Following are the two samples I brought along for the guys to follow if they wanted to. I made up packets of the cut-to-size papers for each card, and passed around baskets for them to choose their own sentiments, decorations, ribbons and printed tags. I must admit: I was a nervous wreck just thinking about this coming up. Number one, the timing was horrible. 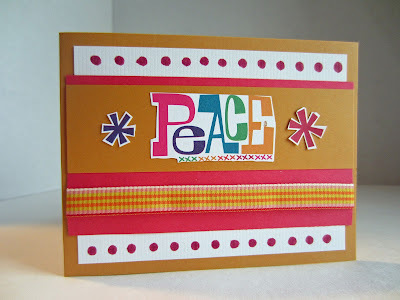 I was to use this past week preparing for a Stamp-In Workshop to be held on Monday, December 14. I got absolutely NOTHING done as far as those preparations go. I have only a handful of Christmas cards written out. My kitchen is filled with gifts that make me feel guilty every time I walk by them: "Hey!! What about us?? Get us wrapped!" Plus I was scheduled to work four days this week. In retail. Added to the aforementioned, I was nervous about this project that was so outside my comfort zone. I had no idea what to expect. Well, I must admit it was quite the satisfying experience. Nineteen, mostly very young men, showed up to make my cards. As I handed a packet to each individual, I received a "thank you" from every one. For the most part, they were, if not exactly enthusiastic, very polite and receptive to what I had to offer. They did use a bit more of the ribbon than I'd anticipated, so I ended up running out. But, that seemed to be the only glitch. Some of the guys really loaded up their cards with my cut-up decorations. Some had trouble with the ribbons. Several of the guys wrote long notes/letters inside their cards. A few of them came prepared with things they had printed out on a computer that they wanted to incorporate into their own cards. One guy did elaborate drawing on his card. So much so, that we were already finished with the second card, and he was still drawing away. Not many questions. They simply worked diligently and got 'er done. If they were making their card(s) for a special someone or two, they were to have the addresses with them (or in their heads) to write on the outside of an envelope. If their card(s) were not for someone personal, they merely created two and handed them over to be given to the jail chaplain for distribution. It was a pretty quiet 1 1/2 hours. A few nice comments about how a son will like getting this card and that he won't be able to see his kids for Christmas and how nice it was to be able to do this project. "Better than sitting on the block." As they filed out of the room one-by-one, several of them shook our hands, thanked us for coming, and a few even wished us a Merry Christmas. I left there feeling very gratified that I was able to provide even this little respite for them. Small as it was. Wow! What an amazing experience, for both you AND them! It brought tears to my eyes!! That's outstanding. I'm sure glad it went well. Now to have some time to yourself. What a neat experience! Wow! Hey good job visiting those in prison. It's one of the ways we can be Jesus' hands and feet on earth! You are awesome! What a great service project for you to use your talent! Win/win for everyone! Thanks for sharing on Sunday FUNday! Wow! Sounds like this was a great experience for both you and inmates. I think it's sweet that the inmate is sending his card to his son since he won't get to see him for Christmas. Thanks for sharing at the Submarine Sunday Link Party!! Great story. Thank you for sharing!